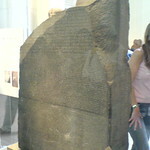 The stone is believed to have originally been displayed within a temple, possibly at nearby Sais. It was probably moved during the early Christian or medieval period, and was eventually used as building material in the construction of Fort Julien near the town of Rashid (Rosetta) in the Nile Delta. 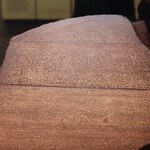 It was rediscovered there in 1799 by a soldier named Pierre-François Bouchard of the Napoleonic expedition to Egypt. 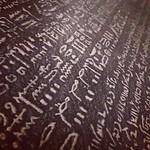 It was the first Ancient Egyptian bilingual text recovered in modern times, and it aroused widespread public interest with its potential to decipher this previously untranslated ancient language. 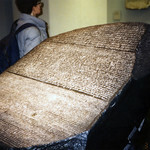 Lithographic copies and plaster casts began circulating among European museums and scholars. 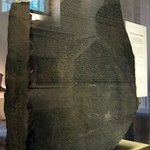 Meanwhile, British troops defeated the French in Egypt in 1801, and the original stone came into British possession under the Capitulation of Alexandria and was transported to London. 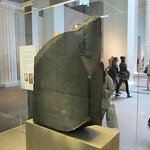 It has been on public display at the British Museum almost continuously since 1802. 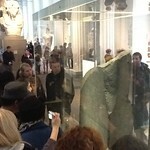 It is the most-visited object in the British Museum. 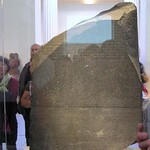 Ever since its rediscovery, the stone has been the focus of nationalist rivalries, including its transfer from French to British possession during the Napoleonic Wars, a long-running dispute over the relative value of Young and Champollion's contributions to the decipherment, and, since 2003, demands for the stone's return to Egypt. 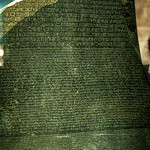 Two other fragmentary copies of the same decree were discovered later, and several similar Egyptian bilingual or trilingual inscriptions are now known, including two slightly earlier Ptolemaic decrees (the Decree of Canopus in 238 BC, and the Memphis decree of Ptolemy IV, ca. 218 BC). 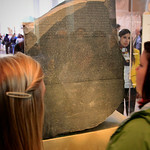 The Rosetta Stone is, therefore, no longer unique, but it was the essential key to modern understanding of Ancient Egyptian literature and civilization. 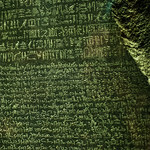 The term Rosetta Stone is now used in other contexts as the name for the essential clue to a new field of knowledge.